When the Medicare Advantage community received an ‘earlier than normal’ CMS Advanced Payment Letter/Part I Draft Release on Dec. 27, 2017, plan leaders were justifiably apprehensive about preparing for these sweeping, complex changes. Early release of the draft and a 60-day comment period required for these changes to the Medicare Advantage (MA) model is sending warning signals to MA plans. This is a real break from the normal cadence which is a signal to leaders that they should begin the process of marshalling the expertise and experience needed to prepare for this anticipated, complicated transformation. While this is a draft, with subsequent releases from CMS expected in February and April that will refine what is implemented, it is evident that serial changes are underway. To assist MA plans that face this new complex regulatory environment, and deal with the reality of what needs to be accomplished in a very short timeframe, the following highlights provide a starting point for consideration. The importance of these discussions cannot be over-emphasized — financial and clinical adjustments will affect operational processes that impact plan performance, patient care and compliance. Based on the 21st Century Cures Act signed by President Obama in December 2016, the new MA community model (v23) and risk scores must be modified to account for evaluating the addition of mental health, substance use disorder, and chronic kidney disease conditions. MA plans will also be required to consider the total count of conditions indicated. CMS is reviewing with the industry two methods counting all applicable condition categories or only categories used for payment in the risk adjustment model. CMS has indicated they will implement changes phased in over three years (2019-2022) for enrolled community members. Anticipated changes include the addition of new Hierarchical Condition Categories (HCCs) and remapping of ICD-10 codes to HCCs based on a new model. New Risk Score Attributes for Payment Condition Count add-ons may consider two approaches: 1) All HCCs to count or consider all applicable diagnoses that map to a condition, even if it is not used in the Risk Score Model 2), and payment model HCCs may only consider diagnoses that map to conditions in the Risk Adjustment Model HCCs. 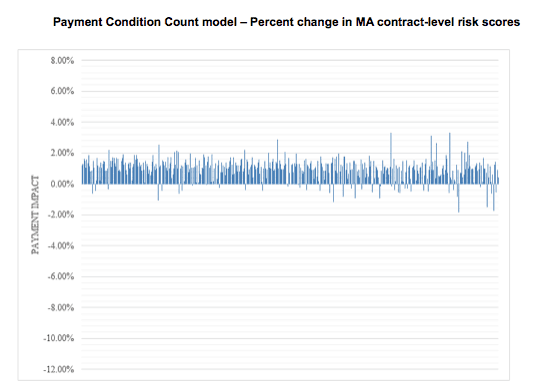 This graph displays the estimated percent change in payment for 446 MA contracts. Each line indicates the Payment Condition Count model’s estimated impact on payment for one contract. This graph displays the estimated percent change in payment for 446 MA contracts. 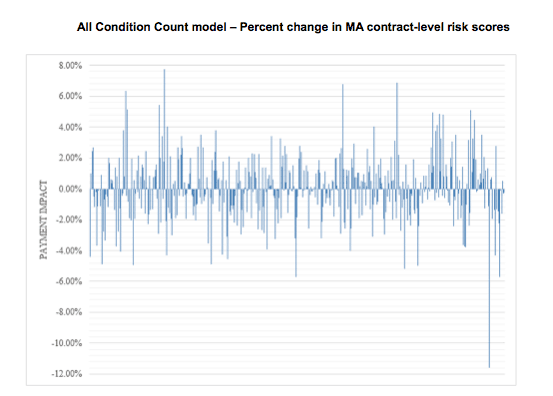 Each line indicates the All Condition Count model’s estimated impact on payment for one contract. Concurrently updating the risk model for the community members, CMS is still transitioning the data collection method from the Risk Adjustment Payment System (RAPS) system to the Encounter Data Processing System (EDPS) system, further complicating the impact of the model change to MA Plans. Shown in the chart below, 25 percent of the 2019 Payment Year risk score for community members will be attributed to the new v23 model and the EDPS data collection method. The other 75 percent will be attributed to data collected under the RAPS system, and will continue to use the current v22 risk model. 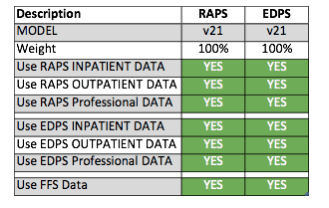 Additionally, CMS is proposing to combine the RAPS inpatient data to the EDPS data when used with the v23 model, providing a more robust inpatient data set. In short, the majority of the first-year value will be from the RAPS data collection method and the v22 2017 risk model for community members. 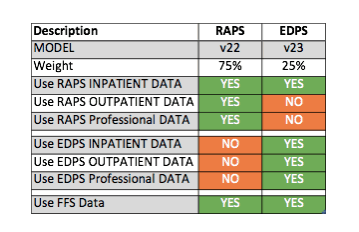 PACE Plans will continue to use the v21 model and utilize all data submitted under both RAPS and EDPS, as seen in the below chart. Today, it is critical for PACE plans to have a solid operational and technical process to submit EDPS data and correct and resubmit rejected data in addition to RAPS. CMS is still evaluating the ESRD model, and will make a determination if any changes are required for PY 2019 at a future date. Model coefficients require updates at least every three payment years to maintain accuracy. The 2019 proposal uses Date of Service (DOS) 2014 to predict costs in 2015. CMS is proposing to not use DOS 2015, because the ICD-10 introduction in 2015 caused data quality and consistency issues; the next calibration will use DOS 2016 or later. The new v23 HCC clinical model will expand the suspecting and targeting for community populations to conditions and specialties that have not been previously targeted, such as behavioral specialists and drug and substance care. Targeting expansion is required to ensure accurate counts, and complexity will increase because all will be phased in concurrent to phasing in the EDPS over the RAPS. Health plans should be reviewing theses change for impacts to their technology/analytics, provider training/engagement, overall operational strategies and the readiness of their vendor partners for these impending 2019 changes. It is evident that the complexity of these changes just increased the burdens upon MA plans – and the clock is ticking. To be assured consideration, comments on the proposals announced should be submitted to CMS by March 2, 2018.